In its earliest years, the Church established a period of approximately forty hours to prepare the catechumens (those aspiring to be Christians) for baptism at the Easter Vigil. This period of preparation subsequently took on a penitential character and was extended to forty days, the model now being Jesus’ forty days of fasting in the wilderness and Noah’s forty days in the flood. Because all Sundays were regarded as commemorations of Christ’s resurrection, they did not figure in the 40 penitential days, the first of which was therefore calculated to fall 46 days before Easter, on Ash Wednesday. The English-speaking world knows this six-and-a-half-week period as Lent; its Latin name is Quadragesima (forty days). During Septuagesima, which extends from the Sunday two and a half weeks prior to Ash Wednesday until the Easter Vigil, the Church allows no singing of Alleluia, Sequence, or Gloria (an exception for the Gloria being made on feast days and Holy Thursday), for joyful song would contradict the somber mood of the season. Instead, for nine weeks Christians direct their thoughts to Christ’s suffering. The introit of Septuagesima Sunday (also known as Dominica Circumdederunt) signals the new mood by quoting the most melancholy words of the Psalter: Circumdederunt me gemitus mortis; dolores inferni circumdederunt me (“The groans of death surrounded me; the sorrows of hell encompassed me”) (Psalm 17: 5-6). The tract continues similarly, citing the first verse of Psalm 129: “Out of the depths I have cried to Thee, O Lord.” Earlier on this same day, the reading of a lesson in the first Nocturn of Matins had presented the Genesis account of the fall and subsequent misery of man. As the Lenten season builds to the climax of Good Friday, the Church progressively withdraws adornments from its buildings and its rite. On Palm Sunday, following the reading of the Passion narrative by Matthew, the organ falls silent until the Paschal Vigil (except for the solemn Mass of Holy Thursday). Following that Mass, all bells likewise fall silent and the clergy strip the altars of their cloths and decorations, removing most of the candles. Darkness and austerity prevail. In the Renaissance, the unfolding of passiontide required elaborate musical textures to yield to stark plainchant and the simplest polyphony. Thus, just as the jubilation of Easter called for composers to celebrate Christ’s resurrection in exuberant song, so, in equal measure, did the emotional austerity of Lent discourage music that did not reflect the abstinence of the season. Accordingly, Renaissance composers rarely set texts for this time beyond the Lamentations of Jeremiah (sung in nine stages in the three Matins services prior to Easter), selected Holy Week responsories, and three great hymns (Vexilla regis prodeunt, Pange lingua gloriosi corporis, and Crux fidelis…Pange lingua gloriosi lauream). The celebration of Easter and the Easter season, on the other hand, when bells rang, candles blazed forth, and alleluias abounded, demanded composers’ most festive works. Accordingly, we find an extensive repertory of Renaissance polyphony celebrating Christ’s resurrection. 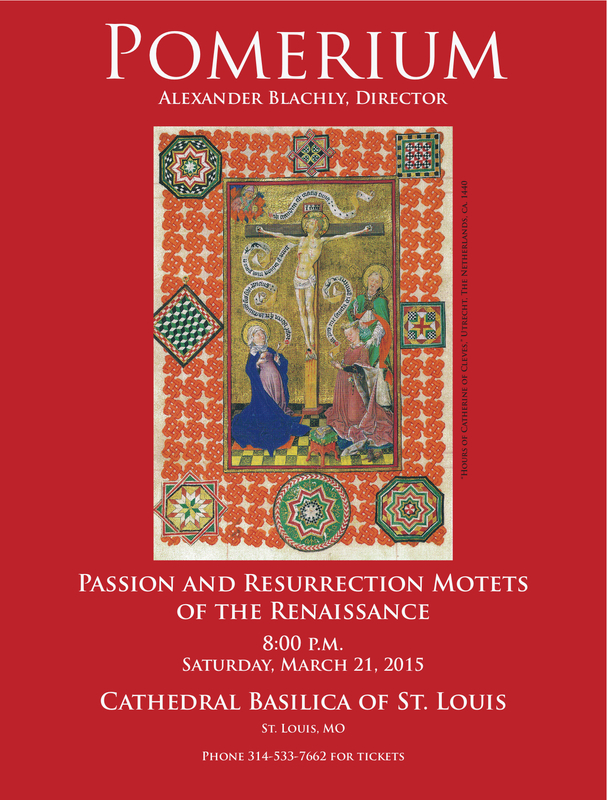 Today’s program highlights the stylistic progression in sacred music from ancient Gregorian chant to the polyphonic elaboration of chant practiced by Du Fay and Senfl to the increasingly specific and dramatic musical depiction of words and ideas in the music of Lassus, Monteverdi, and Gesualdo. Chant endows words with melody, heightening their significance (hence the place of sung words in almost all rituals). Polyphony heightens the specificity of melody in the same way that melody heightens the specificity of words, and it can remove words still further from everyday use. In the hands of a great composer, a text set to polyphony is like rhyming poeticized—it has become high art. Though composers in the early Renaissance had mastered the technique of setting words to polyphony, they showed little interest in passion and resurrection texts as such. The repertory of resurrection motets, however, expands considerably after 1550, when composers such as Lassus and Byrd produced vast numbers of liturgical settings for nearly every season. Especially popular with the more “rhetorical” composers were texts that emphasized a specific emotion, or several such emotions juxtaposed. The reason why composers should have embarked on a widespread campaign to set liturgical texts in the later Renaissance can be explained by the growing interest on the part of both composers and listeners in the power of music to capture, evoke, or illustrate the words being set. Sometimes referred to as “word-painting” or “madrigalizing,” the practice of harnessing the emotive power of music to the depiction of specific verbal images marks an evolution in musical style—an evolution that has continued to the present day, when the illustration of words in tones has become something to be taken for granted in music of all styles and genres. It should be noted that for Du Fay and other composers of the fifteenth century the goal was less to “illustrate” a text than to reflect, in individual works of art, the laws and structure of universal “music,” that is to say, the laws of language, of musical counterpoint, and of the universe as a whole. Thus, in early fifteenth-century music, formal, and perhaps mystical, values still took priority over purely emotive ones. But as humanism gained momentum in art, literature, and architecture in the later decades of the fifteenth century, the emotive power of music came to be regarded as a virtue. Over time, composers sought to endow all the texts they set with increasingly pictorial and dramatic music. By the end of the Renaissance and the beginning of the Baroque, the dramatic illustration of ideas, especially of emotional states, had become so widespread that it spilled over into music for all seasons—even of passiontide. In a manner that would have been unthinkable to Du Fay, Gesualdo gave expression in his Holy Week responsories to sentiments of remorse, guilt, and sorrow. The emotions are not just explicit but extreme. Separated by two centuries (ca. 1430-ca. 1610), the works by Du Fay and Gesualdo on today’s program represent the alpha and omega of Renaissance music, its beginning and end.